Junior Bio-Caps is a natural multi vitamin and multi mineral supplement which contains pure additive free ingredients necessary to ensure the elements are available for proper growth and well being. Good nutrition for children is most important to enable proper mental and physical development. Children can be faddy eaters, often choosing to eat the same type of food rather than a wide variety. Unfortunately the foods they choose are not always the best for their health. A well balanced supplement will ensure the necessary elements are available for proper growth and well being. Bio-Health’s Junior Bio-Caps can be sprinkled on food or swallowed with a drink. Bio-Health’s Junior Bio-Caps are recommended by the Hyperactive Support Group and Action Against Allergy. Vitamin A is excluded from this product. If desired Vitamin A can be taken separately and is a natural component of fish oils and dairy products. Calcium Carbonate; Kelp Powder; Vegetable hydroxypropyl methylcellulose (HPMC); Magnesium Oxide; Vitamin C; Iron Fumarate; Zinc Oxide; Niacin as Nicotinamide; Vitamin E; Manganese Sulphate; Pantothenic acid as Calcium Salt; Copper Sulphate; Vitamin B6 as HCI; Thiamin HCI; Riboflavin; Potassium Iodide; Chromium Chloride III; Sodium Selenite; Sodium Molybdate; Folic acid; d’biotin; Vitamin D; Vitamin B12. Children between 5 and 12 years, take 1-3 vegicaps per daily. Below are reviews of Junior Bio-Caps - Multi Vitamin - 60 Vegicaps by bodykind customers. If you have tried this product we'd love to hear what you think so please leave a review. 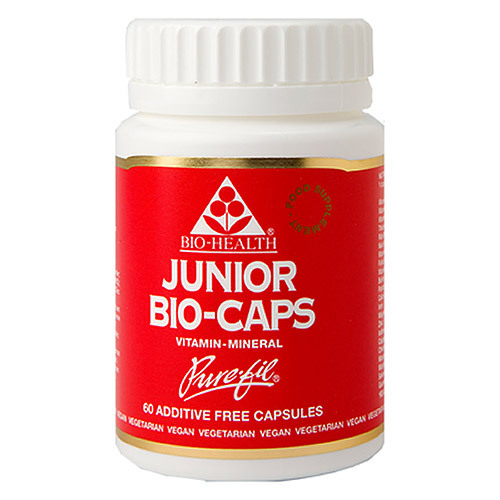 Bio Health Junior Bio-Caps is a natural muti vitamin and multi mineral supplement which contains pure additive free ingredients necessary to ensure the elements are available for proper growth and well being.